This year's Vuelta (Tour of Spain) started yesterday without my noticing (too much Olympics!). The "Ponte Vella" bridge depicted in the arms was built by the Romans and (thanks to many rebuilds) survived Suebi, Moors, Norsemen, Moors again and the reconquista. It once carried the road to Santiago de Compostela, but is now restricted to foot traffic. Blazon of the arms of Ourense province: En campo de plata, puente peraltado de cinco arcos en su color natural, sumado de un castillo del mismo, con puerta y ventanas aclaradas de gules, a diestra; a siniestra un león rampante de gules empuñando, con la diestra, una espada de lo mismo; en jefe una corona real cerrada; en punta tres ondas de azur y plata; al timbre corona real cerrada, forrada de gules. 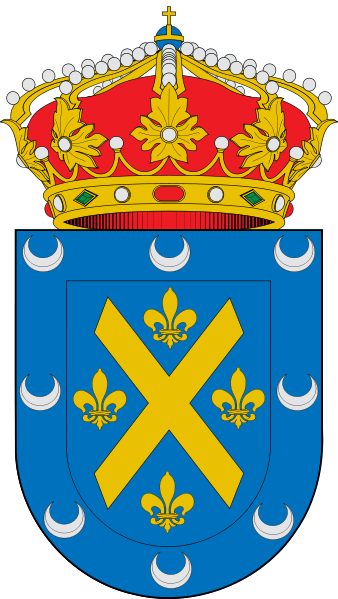 Blazon of the arms of Galicia: En campo de azur, un cáliz de oro sumado de una hostia de plata, y acompañado de siete cruces recortadas del mismo metal, tres a cada lado y una en el centro del jefe. El timbre, corona real, forrada de gules, o rojo, cerrada. The arms of Galicia, as presented here, are exceptionally good heraldry IMO - simple, clean, distinctive, easily remembered and recognized even in small scale or at a distance. Today's stage takes the riders from Marín to Dumbria, both on the Atlantic coast of Galicia. 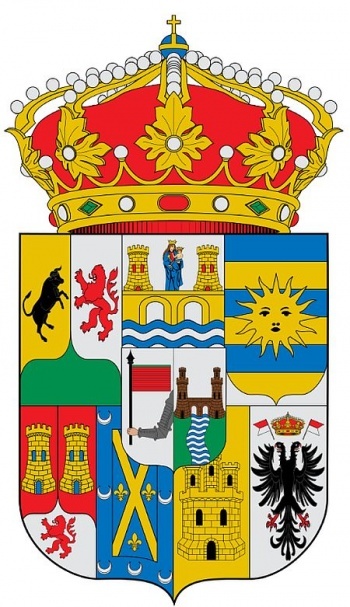 Marín's arms include a bridge with a castle not unlike that which we saw yesterday associated with Ourense, though Marín is in Pontevedra province not Ourense. The Latin motto "Nostra In Mare Fortuna" (Our Fortune in the Sea) probably refers to Marín's fishing industry, and the anchor to the fact that the Spanish Navy has its Escuela Naval Militar de Oficiales (Naval Academy for Officers) there. Blazon: Partido; 1º, de oro, pino acostado de dos osos afrontados, todo al natural; 2º, de gules, torre sostenida de puente de tres arcos, todo de oro; entado en punta, de azur, un ancla de oro coronada de lo mismo. Bordura de azur, con la divisa NOSTRA IN MARE FORTUNA en letras de oro. Al timbre, corona real cerrada. The two bears and the strawberry tree remind one of the arms of Madrid "el oso y el madroño" https://en.wikipedia.org/wiki/Coat_of_arms_of_Madrid, though Galicia is far from the capital. This element may refer to another province but I have yet to discover which. Blazon: De azur e sobre ondas de azur e prata, unha ponte alombada de tres ollos, sumado á destra dunha porta de muralla, defendida por dúas torres ameadas, á sinistra dunha muralla ameada, movinte do flanco e adestra dunha torre-porta, tamén ameada, e no centro dunha cruz latina e piñonada; todo de ouro e aclarado de gules. Ó timbre, a coroa real pechada. Today takes the Vuelta from Betanzos to San Andrés de Teixido still in Galicia. We must I suppose bear in mind that the bridge and the castle were for perhaps more than a thousand years the most important elements in many communities. I haven't found the Spanish blazon for this CoA and just wonder how they explain the vert/vert waves in base. Blazon: Cortado. De sinople, banda de oro engolada en cabezas de dragón del mismo metal y bordura de plata cargada con la salutación AVE MARIA GRATIA PLENA. De oro, tres peñas de sinople sobresaliente la del centro acostada de dos matas de sinople hojadas de siete hojas y sostenida de ondas de azur y plata. Al timbre, corona real cerrada. Once again I can't find the Spanish blazon, so I am not sure whether the base is simply azure and the artist has applied the short lines to suggest water, or whether said lines form part of the blazon. Similarly I am unsure whether the white edge is part of the arms or merely the edge. Blazon: En campo de azur, una torre donjonada de oro, aclarada y terrasada de gules, acostado de dos leones afrontados, de oro, rampantes contra la torre, y sumada de un cáliz de oro, sumado a su vez de hostia de plata, radiante de oro, y acostado de dos ángeles en adoración afrontados, de plata, sobre sendas nubes del mismo metal. Bordura de plata con la divisa: "HOC HIC MYSTERIUM FIDEI FIRMITER PROFITEMUR" en letras de sable. Al timbre, corona marquesal. "Hoc Hic Mysterium Fidei Firmiter Profitemur" means "Here Is The Mystery Of Faith That We Strongly Profess" and refers, if my understanding of the Spanish Wiki entry is correct, to the Holy Sacrament exhibited on the altar of Lugo's Cathedral, which led to Lugo being called "A Cidade do Sacramento" (The City of the Sacrament). It surprises me that Lugo's arms do not include walls and towers since Lugo has the only intact circuit of Roman city walls anywhere in the (Roman) world, with no less than 71 towers. Blazon (in Galician Spanish): De prata (branco) un monte de ouro (amarelo), sumado dunha torre do mesmo, acompañado no centro do xefe dunha tau de gules (vermello) e de seis roeis de azur (azul) nos flancos. Ó timbre, a coroa real pechada. If Wiki is to be believed, the process of formally approving the current arms in 2002 was controversial as the Heraldic Council of Galicia proposed the elimination of the Tau Cross of St Anthony, but it was eventually retained due to the order's close relationship with the town and its principal family. 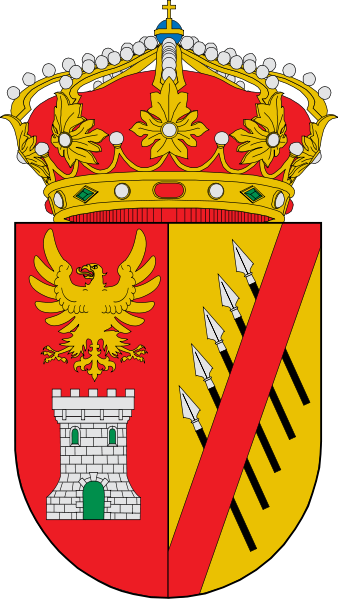 Given that the cross is the only element of the arms that distinguishes Monforte's arms significantly from masses of other Spanish arms based on castles, the citizens are to be applauded for their stout defence of their traditional blazon. Blazon: Escudo partido. Primero, de gules, una torre de plata aclarada de sinople y surmontada de un águila de oro. Segundo de oro, cinco lanzas de plata fustadas de sable puestas en banda, y brochante una barra de gules. Al timbre, corona real. My Spanish really is not up to criticising the blazon, but the description of the lances and bend sinister seems suspect, or is it the emblazonment? The Vuelta then crosses from Galicia into Castile & Leon with the finishing line in Puebla de Sanabria in the Province of Zamora. There seems to be some confusion as to the arms of Puebla de Sanabria. Is the saltire supposed to be gold or gray? Should the crescents point upwards or downwards? Blazon (for version 2): En campo de azur, una cruz de San Andrés de oro, acompañada de cuatro lises de oro, una en cada hueco, y bordura cosida de azur con ocho crecientes de plata. The answer seems to be that the version with a gray/black saltire is the "official logo" and appears in the town hall's web-site. The version with the gold saltire is the traditional (and almost certainly the officially approved) version. Blazon: Escudo cortado, 1º terciado en palo, a) mantelado, primero de oro, un toro al natural rampante y alterado, segundo de plata, un león rampante de gules, y mantel de sinople (que es de Toro); b) de plata, un puente de oro sobre ondas de agua de azur y plata, cimado el puente de la imagen de la Virgen con el niño y a cada lado de ella una torre, también de oro y aclarada de gules (que es de Benavente); y c) de plata, un escudo, que toca los bordes del campo, fajado de azur y oro y brochante sobre el escudo un sol de oro (que es de Villalpando); 2º partido, a) mantelado, primero y segundo de gules, una torre de oro, mantel de plata, un león rampante de gules (que es de Alcañices); medio partido de azur, una cruz de San Andrés de oro, acompañada de cuatro lises de oro, una en cada hueco, y bordura cosida de azur con ocho crecientes de plata (que es de Sanabria); y b) de oro, un castillo de oro aclarado de sable (que es de Bermillo de Sayago); medio partido de plata, un águila exployada de sable y picada de gules, superada de una corona real cerrada y a cada lado de ésta un estandarte de gules y plata astado de oro ( que es de Fuentesaúco). Sobre el todo escusón con las armas de Zamora capital. Timbre: Corona real cerrada, forrada de gules y plata. Here's a conundrum. Both Boutell and Friar tell us that a crescent is normally shown with the points upward (another reason why the second version of the Puebla de Sanabria arms is the correct one). If the points are to the dexter it is an "increscent" to the sinister a "decrescent". But neither worthy vouchsafes the name of a crescent with the points facing downwards. Any ideas? Blazon: Escudo fajado de azur y oro y brochante sobre el escudo un sol de oro. The Spaniards seem not to distinguish between barry and four bars. "Fajado" here simply means "banded". As for the motto (not mentioned in the blazon unlike those of many other towns), I am - currently - foxed. Google gives "ranita" as Spanish for "romper suit" or possibly "little frog", neither of which seems likely. No such Latin word seems to exist. Both "gloria" and "extolle" are straightforward Latin: "glory" and "extol/praise". So are the good people of Villalpando being exhorted to "Extol the Glory of the Little Frog/Romper Suit"? It seems highly improbable. Villalpando was once a strategic location between Zamora, Leon, Valladolid, Salamanca and Madrid, and as such was equipped with substantial walls and fortified gates as well as the castle of the Constables of Castile. It was renowned for its salt-pans, a valuable resource so far from the coast. I believe it was Guillim who observed that Continental Europeans didn't observe the English convention that "barry" must be of an even number. As for the motto, my first thought was that "[even] the little frog extols the glory [of God]," but then I noticed that the word is rantia, not ranita. Over to the Latinists. Chris Green wrote: Here's a conundrum. Both Boutell and Friar tell us that a crescent is normally shown with the points upward (another reason why the second version of the Puebla de Sanabria arms is the correct one). If the points are to the dexter it is an "increscent" to the sinister a "decrescent". But neither worthy vouchsafes the name of a crescent with the points facing downwards. Any ideas?